Welcome to September friends! It’s a most beautiful month ahead with the hint of autumn coming. 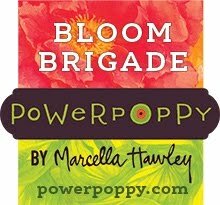 This month I am your hostess for the Power and Spark Challenge at Power Poppy! It’s a fab fun challenge that runs all month long, and if you enter to win, you could be chose for a $50 Shopping Spree at Power Poppy! I love it because it get’s your creativity moving in new directions each month. This month I chose the theme, Cozy Krafty Colouring. With summer winding down in the Northern Hemisphere, let's get warm and cozy by creating with Kraft cardstock as our stamping and colouring layer. 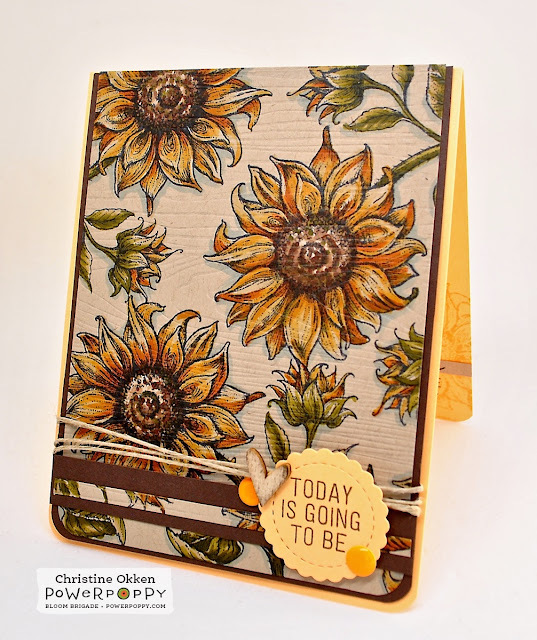 For my design today I couldn’t resist pulling out Power Poppy’s set In Praise of Sunflowers for a perfect summer to fall theme. Sunflowers are some of my favourite blooms. This spring my niece and my mom planted two rows of sunflowers in mom’s garden. Mom thought they were more dwarf size.....nope, they are mammoth! They tower over her garden right now at about 12 feet. 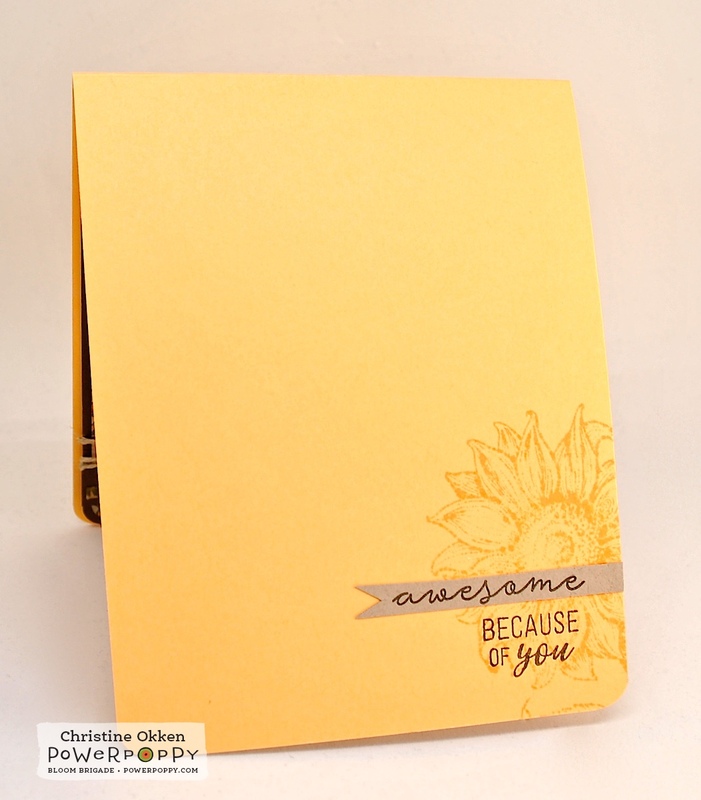 For this design I stamped the pretty sunflowers randomly over the Kraft Cardstock and then gave them some warm colour with Copics. I find that when you’re colouring on Kraft, you have to use more vibrant colours to get the saturation you’re looking for. After it was all coloured up, I used a woodgrain embossing folder and added to the rustic appeal with some texture. A few finishing details include some twine, a wood veneer heart that I distressed with a little ink, and then a few enamel dots. The card finishes the sentiment inside. Here’s the Copics I used to make these sunflowers cozy. Be sure to join us this month in the Cozy Krafty Challenge. I’ll look forward to seeing your designs! I just had to leave you a comment! The coloring on this card is A number 1!! 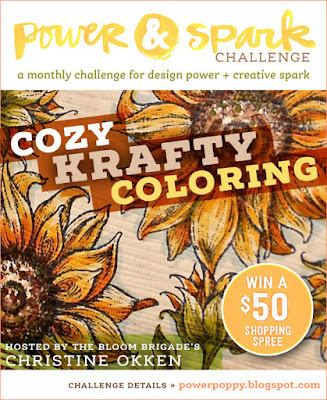 It is so pretty and I love the idea of this challenge. Thank you for sharing. What a great challenge! This looks amazing, Christine. Fantastic coloring and I love the wood grain embossing. Good tip about using more intense colors. The inside is super cute, too, and the mistake made it better, for sure! So beautiful. So glad your oops was fixable. It looks great this way. Such pretty sunflowers. Your coloring looks fabulous. Thanks for sharing your beautiful card. I literally gasped when I saw this card Christine. Beautiful rich colors against the kraft background. 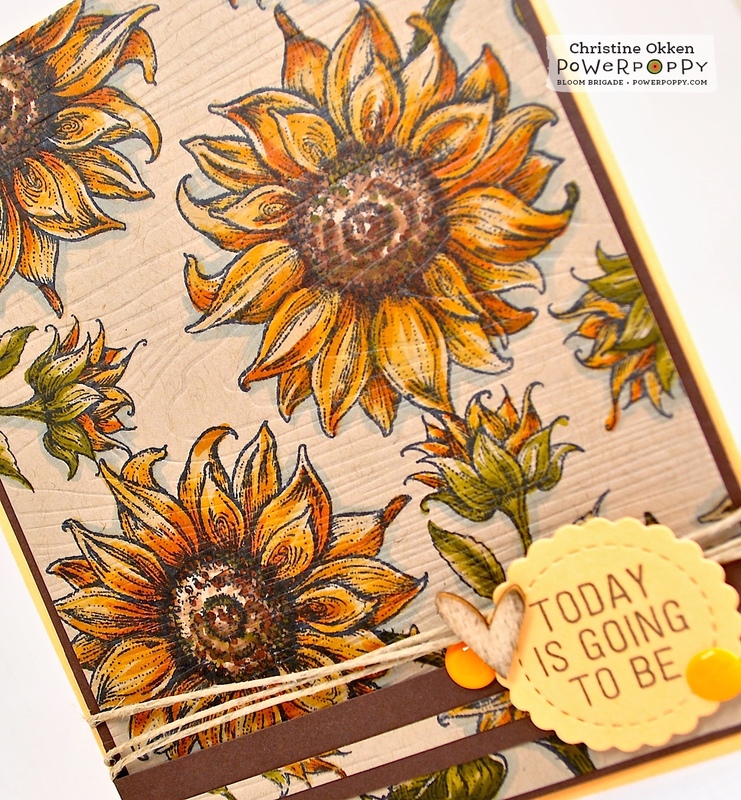 Love this... the woodgrain texture is great with these sunflowers. Not to mention your beautiful coloring on them. Fabo card.